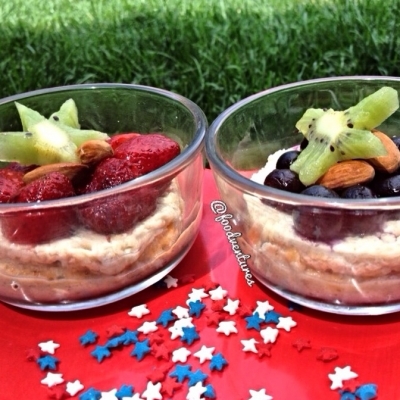 In honor of Memorial day, I made these festive mini cheesecakes but you can alter the toppings for any occasion. These mini protein cheesecakes are layered on top of a graham cracker/date caramel/oat crust and topped off with strawberries, blueberries, almonds, and kiwi stars. The cheesecakes themselves are vegan but the crust is not so feel free to swap out the protein for a plant based protein. Combine all ingredients. Mix well. Mixture will be very thick. Preheat oven to 350 degrees F and scoop mixture into two small ramekins. Bake ~40 minutes. Remove form oven and let cool. Prepare your crust (is using) and press into the bottom of two small bowls. Layer your cheesecakes on top of the crust. Top off with your fruit toppings.